Omer Mix Camu 3D Apnea and Spearfishing Wetsuit 5mm. 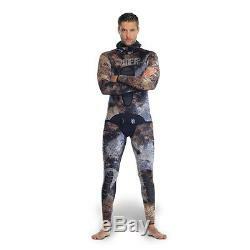 Camouflage wetsuit with an open cell interior and Nylon exterior. We are the first company to introduce a 3 Dimensional photographed camouflage pattern giving the diver the opportunity to camouflage themselves virtually perfectly on the bottom. The hooded top is available in 3mm, 5mm and 7mm equipped with a new chest pad reinforcement to assist the hunter comfortably in a two-part loading phase. The bottoms are reinforced around the knee area with abrasion resistant material. 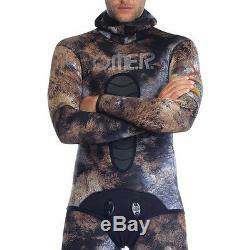 The item "OMER SUB WETSUIT MIX CAMO CAMU 3D 5MM FREEDIVING SPEARFISHING SCUBA 4D" is in sale since Saturday, December 16, 2017. This item is in the category "Sporting Goods\SCUBA & Snorkelling\Wetsuits\Other Wetsuits". store" and is located in Cafaggio. This item can be shipped worldwide.